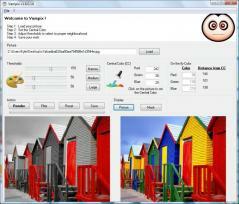 Vampix is a handy piece of software designed to let you easily tweak color, black, and white filters in your photos. The program lets you work only with JPG images and you can load a photo via drag and drop or using the app’s file browser. Then, you can set a base color by entering the RGB values, tweak the thresholds or choose one of the provided presets (narrow, medium or large). You can also view on-the-fly color value and the difference between them and the base color values. Furthermore, Vampix lets you switch between picture and mask mode, as well as save the image with a custom name and in a specified output folder.